AUSTRALIA: Head of the International Crisis Group [a subsidiary of the CIA?] and former Labor foreign minister Gareth Evans says while the threat of a terror attack on Australian soil is real, it is a moderate one. Crack that whip, give the past the slip, step on a crack, break your momma's back. He says he is sceptical about reports that suggest 800 potential terrorists are living in Australia and warned police to be careful in applying new Australian anti-terror laws. 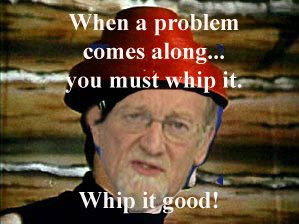 When a problem comes along, you must whip it, before the cream sits out too long, you must whip it, when something's going wrong, you must whip it! "The extreme political correctness that has led some of the American law enforcement authorities to be sort of religiously strip-searching 90-year-old ladies because that's what they have to do to demonstrate that they haven't got any racial bias built into it, is palpably absurd," he said. Now whip it, into shape, shape it up, get straight, go forward, move ahead, try to detect it, it's not too late to whip it, whip it good! Mr Evans says if there are 800 potential terrorists in Australia, it may be the result of government security agencies broadening their definition of Islamic extremism. When a good time turns around, you must whip it, you will never live it down, unless you whip it, no one gets their way, until they whip it! He says there is a big difference between Muslim activists and those with a violent political agenda. "What I fear is that there's a bit of a disposition to run all those categories together, and say 'Anyone who's expressing distaste for the Government and doing so from a kind of religious perspective, is a potentially dangerous terrorist'."